CPR or cardiopulmonary resuscitation is one of the most popular procedures used by a lot of individuals and professionals to revive a patient when his heart suddenly stops beating and his breathing stops. The procedure involves chest compressions together with effective rescue breathing as this work in keeping the blood flowing all throughout the brain and body of the patient while also delivering enough oxygen into his bloodstream. CPR is actually referred by others as the first step when it comes to treating cardiac arrest as this vies enough time for the arrival of professional responders. This means that it can keep a patient alive until more effective and advanced procedures and treatments for cardiac arrest like defibrillation are undertaken. It has been proven that CPR is capable of doubling the chances of cardiac arrest victims to survive. CPR can also be defined as an emergency procedure which can be performed as a means of manually preserving a more intact functioning of the brain until more effective measures are taken to help in restoring the patient’s spontaneous breathing and blood circulation. It is proven to be a huge help for individuals who are already unresponsive due to abnormal breathing or no breathing. The good thing about this procedure is that one can perform it inside and outside the hospital whenever the need arises. 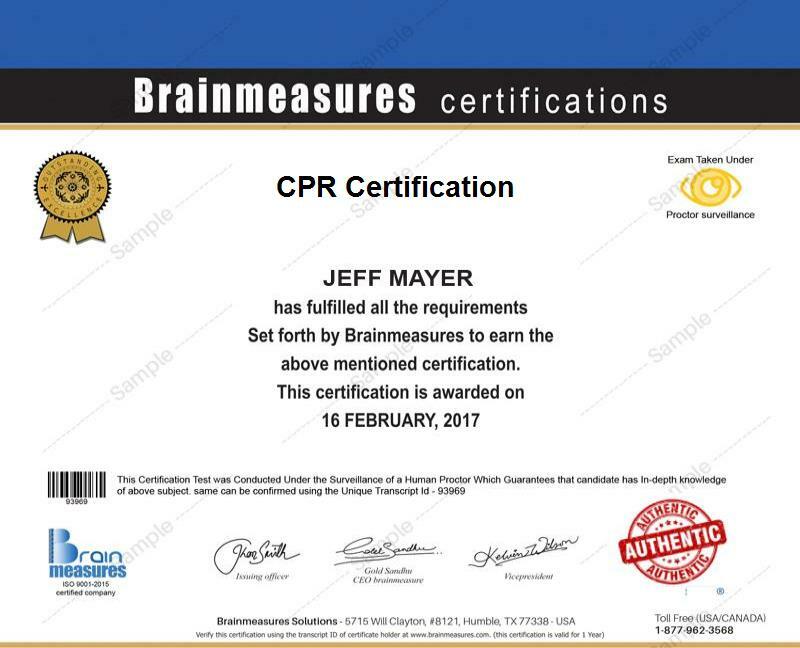 If you want to receive the most comprehensive online CPR training so you can get a full understanding about the pro CPR certification program which is part of the platinum personal trainer certification course offered by Brainmeasures can definitely help you out. The platinum personal trainer certification course is a package consisting of a dozen of individual courses designed to help an aspiring personal or fitness trainer in fully understanding a wide array of areas related to physical fitness and health. But since the package consists of individual courses, rest assured that you can enroll in the CPR course alone if your aim is solely focused towards increasing your knowledge about the CPR procedure. The CPR training which you can get from Brainmeasures is extremely useful in your attempt to become a certified CPR practitioner. This will allow you to handle the procedure effectively and offer your skills and expertise in the field to those who need them right away.If you want to receive the most comprehensive online CPR training so you can get a full understanding about the pro CPR certification program which is part of the platinum personal trainer certification course offered by Brainmeasures can definitely help you out. The platinum personal trainer certification course is a package consisting of a dozen of individual courses designed to help an aspiring personal or fitness trainer in fully understanding a wide array of areas related to physical fitness and health. But since the package consists of individual courses, rest assured that you can enroll in the CPR certification course alone if your aim is solely focused towards increasing your knowledge about the CPR procedure. The CPR training which you can get from Brainmeasures is extremely useful in your attempt to become a certified CPR practitioner. This will allow you to handle the procedure effectively and offer your skills and expertise in the field to those who need them right away. You may also like to know that for emergency situations which may arise anytime anywhere, Brainmeasures also offers another course named First Aid certification. The latter equips you with skills required to effectively handle emergencies. Mastering the cardiopulmonary resuscitation procedure by completing the CPR certification course offered by Brainmeasures is extremely beneficial to a lot of people. It is one of the most ideal courses for you if you are living with a family member who is dealing with a heart problem or any other health condition whose attacks can be primarily treated through CPR and you wish to understand everything about the procedure so you can offer your immediate help in case of sudden attacks. The CPR certification program is also perfect for fitness and personal trainers who want to make sure that they can offer immediate help to their clients in case they break down from the rigorous training or from any other medical reason. CPR certification holders also get the chance to earn a more stable income whether they work part-time or fulltime. CPR certification is a specialized genre which obviously fetches more then just a usual fitness certification. If you practice your profession as a CPR expert, then you can expect to receive an average annual salary of $52,000 or $25 per hour if you get an hourly contract. It should also be noted that the salary for CPR certification holders will vary depending on where they practice their profession. If you work in bigger cities like New York, Miami, Florida and Houston, Texas, then you can expect to earn around $135,000 to $155,000 annually.